I love madewell's snow cone machine from the Brooklyn Flea (via housemartin.) I want to rent a snowcone machine for audrey's next birthday party -- a full year from now... How's that for planning ahead?? 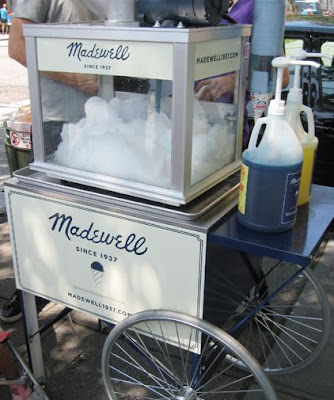 I got an email today saying that the Madewell Snowcone Machine would be at ACL - with free snowcones! Hurrah! it's got such style! oh how I'm wishing Summer wouldn't end! so cool betsy...i'm so jealous i don't live in austin. Madewell is so clever. The first time I actually went into the store they were handing out free cupcakes from the best local bakery. Got me instantly. our club over here just started selling slushies...do you even know how sno-cone deprived we are?! we each had, like, three. So good. I would love a snow cone right now.